Protect your floor and get shock absorbing comfort anywhere with the VViViD Interlocking Foam Floor Mat. These highly durable tile mats are scratch and scuff resistant and keep your floors underneath safe. These mats are incredibly easy to install, thanks to their puzzle-piece style edges, and just as easy to store away when not in use. These mats provide a soft and shock absorbing floor surface, ideal for exercise equipment, yoga, Pilates, Cross-Fit, as well as for use in garages or machines shops, or for children's play areas! Please note: Contains no phthalates. 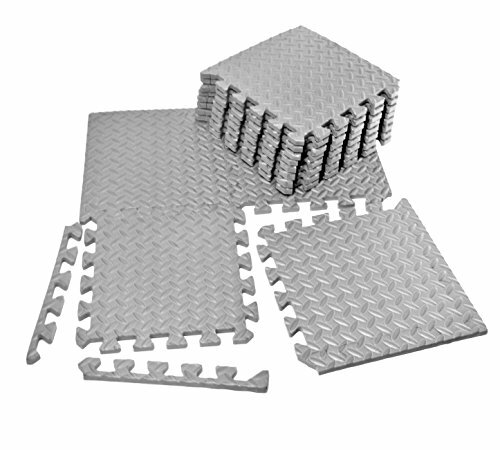 Highly durable, non-toxic EVA foam tiles features non-skid texture protects floors while absorbing impacts and dampening sound. Puzzle-piece configuration is easy to assemble in your desired configuration and just as easily store away when not in use. Each tile is waterproof, scratch resistant and incredibly easy to clean with just soap and water. Each tile measures 11" x 11" and is 1/2" thick. Covers 12 square feet. Also includes 14 smooth edge pieces. Perfectly suited for workout areas, garages, gyms and children's play areas. Each order contains 12 tiles and 12 edge pieces.